Revitalized cottage brings the Caribbean to Carolina with splashes of tropical color and whimsical accents! This four-bedroom three-bath home is designed to get the most out of outdoor living – even if it rains! There are two covered furnished patio areas - great settings for root beer floats and umbrella drinks. Lounge around the pool while the built-in charcoal grill heats up. Inside, there is a front deck accessible to all from the living area. The back deck overlooking the pool has private access from the two main bedrooms. When it’s time to hit the beach, you’re just 100 steps from the Fourth Street access point. 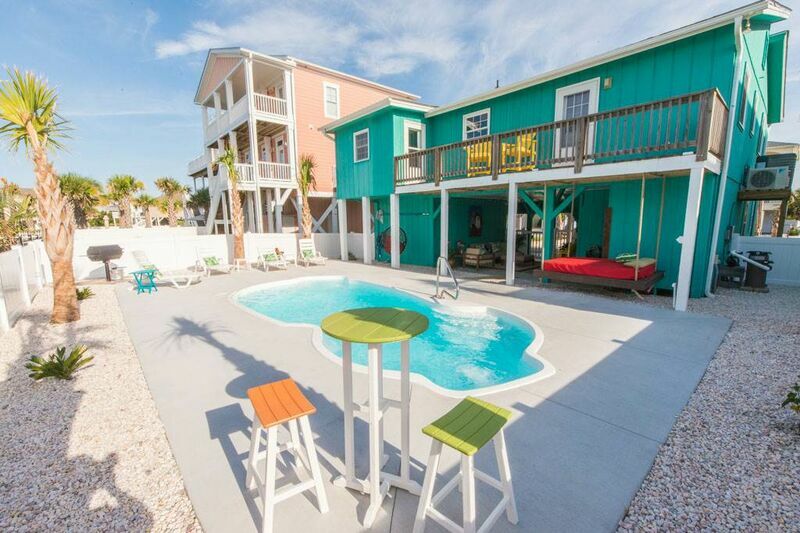 Book it once and you will have found your “forever” beach cottage. All bedrooms have TVs, and the fourth bedroom on the ground level has an attached bath, which can also be accessed from the patio. Three bedrooms have queen beds, and one room has two bunkbed sets, for a sleeping capacity of 10. Bed and bath linens are provided.